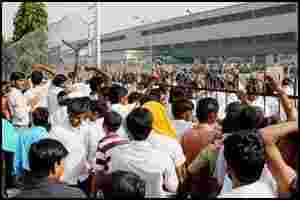 New Delhi: The strike by workers at Maruti Suzuki India’s Manesar plant entered its seventh day on Thursday, with no sign of an end despite the Haryana government declaring it illegal on Wednesday. “The workers are still on strike and there is no production at the plant," a company spokesperson said. On Wednesday, the Haryana Labour Department had declared the strike by MSI workers illegal and said it breached the settlement agreement signed on 1 October to end a 33-day-long standoff. The department had also said it would initiate action to derecognize the unions of SPIL and SMIPL. In the meantime, different trade unions have called for a protest rally in front of MSI’s Manesar plant on Thursday afternoon. Shares of Maruti Suzuki India were down by Rs14.35, or 1.32%, at Rs1,071.50 apiece in early trade on Thursday.